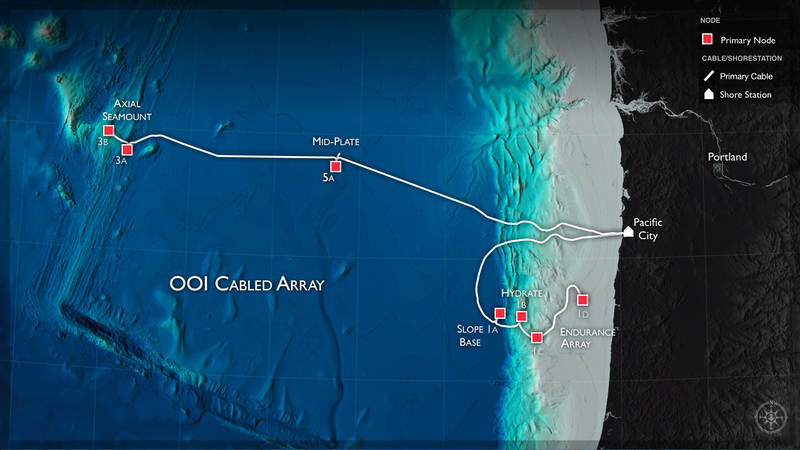 Data from the OOI broadband and short-period seismometers and low frequency hydrophones at Axial Seamount, Slope Base, and Southern Hydrate Ridge and bottom pressure sensors in Axial caldera installed between July-October 2014 are now available through the Incorporated Research Institutions for Seismology (IRIS). Data may be pulled hourly and are available in a variety of formats. We are extremely grateful to Tim Ahern, Director of Data Services at the IRIS Data Management Center (DMC) in Seattle, and his team, for their time and considerable efforts in facilitating this release of OOI data through the IRIS data system. In particular, we acknowledge the assistance provided by DMC staff Rick Benson, Mary Templeton, and Chad Trabant. Thanks also to John Delaney, Deb Kelley, Brian Ittig, Orest Kawka, Dana Manalang, and Chuck McGuire at the University of Washington for their efforts on the OOI side of the collaboration! A Google™ map of the OOI seismometer/hydrophone and bottom pressure sensor locations can be found at: http://ds.iris.edu/gmap/OO. This map also provides easy access to the channel descriptions and the metadata associated with the sensors at each of the Stations listed below. Users interested in archived data can access data through the IRIS web services at http://service.iris.edu where the documentation for the services can be found. The time series tool at the web services URL allows users to select specific instruments/channels and parameter ranges and generate either plots or downloadable datasets. 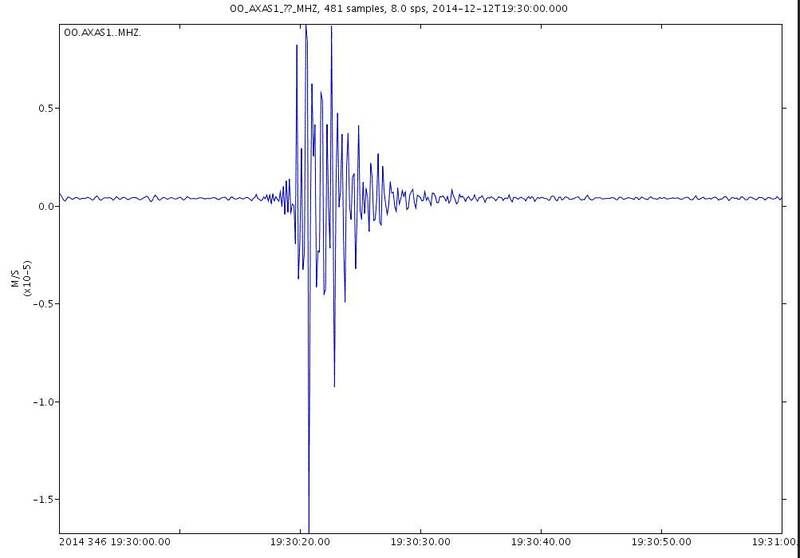 For example, a plot of a seismic event recorded by one of the OOI seismometers on Axial Seamount during a 1 minute interval on December 12, 2014, from the mid-period channel, high pass filtered at 10 Hz, and converted to units of ground motion (meters per second). 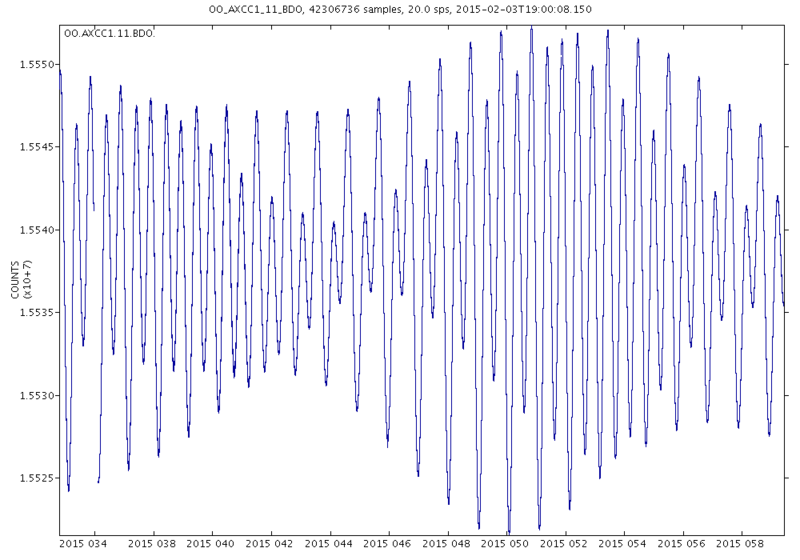 Similarly time series plots can made for longer scale time periods, such as the below plot (also seen here) reflecting pressure data for the Axial Central Caldera for the month of February 2015. NOTE: These preliminary data were collected by the Ocean Observatory Initiative (OOI) project purely for internal system development purposes during the construction phase of the project and are offered for release to the public with no assurance of data quality, consistency, or additional support. The OOI Program assumes no liability resulting from the use of these data for other than the intended purpose. No data quality assurance steps have been implemented on these data to date.